Tottenham manager Mauricio Pochettino is not bored of dismissing links to Real Madrid because it means his team are on track. Pochettino was twice touted for the Madrid job this year after the departures of Zinedine Zidane and Julen Lopetegui. Santiago Solari has the Santiago Bernabeu post until the end of the season but watched his side go down to a chastening 3-0 Champions League defeat against CSKA Moscow on Wednesday. 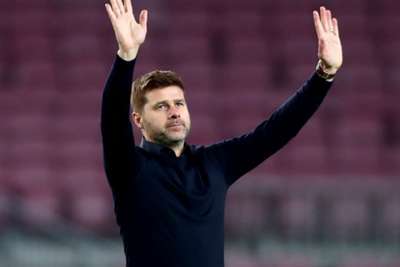 Spurs boss Pochettino took four points off European champions Madrid in last season's competition and saw his stock rise further with a superb 1-1 draw at Barcelona on Tuesday that booked a place in the round of 16. Domestic matters are back on the agenda as Burnley visit Wembley on Saturday and the 46-year-old maintains reports over Madrid being set to renew their interest at the end of the campaign will not prove a distraction. "This type of news does not upset people or bore people," he told a pre-match news conference. "I prefer that the newspapers talk about the things like you are telling me rather than talking about things like Tottenham is going to sack me or people are tired of me and we are in a difficult situation. "Of course, if I need to choose one situation, I choose this one. I am not bored, of course." How did you feel when this went in? Tottenham are six points behind Premier League leaders Liverpool and five shy of champions Manchester City, with Pochettino content for them to continue flying below the radar in the title race. "We are there, we are in a good position," he said. "It is normal that the perception is different and I am happy for the perception today when you only talk about Manchester City and Liverpool and not us. I am not happy with the perception when they are not assessing us in the right way. "After investments and many things when you assess the different clubs, normally it is Manchester City, Liverpool, Chelsea, Manchester United and Arsenal who will be involved in the race for the title. Not Tottenham. "But we are there because we compete in a very good way and our performances have been fantastic. Of course, the perception is different." Right-back Kieran Trippier could return from a groin problem to face his former club, while centre-backs Juan Foyth and Davinson Sanchez are battling to overcome hamstring injuries. Serge Aurier (groin), Mousa Dembele (ankle) and Victor Wanyama (knee) remain sidelined. Meanwhile, Pochettino insisted no talks have taken place with Fernando Llorente after the striker expressed an interest in returning to Athletic Bilbao during the forthcoming transfer window.